Chicken for sale at your local Chiang Mai supermarket. Say no more. How does this differ from the wet markets across Thailand? 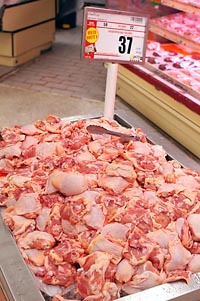 For starters, meat is generally kept in one spot. I don’t even like to venture into the dim, greasy meat cubicle of our local market, but at least the meat juices don’t trickle into the noodle and cracker aisle as they did here. Besides, I somehow expect more of a modern supermarket. Many people shop here because they can find import items and produce wrapped in plastic, which is presumably safer, cleaner. I personally don’t like plastic on my eggplants, but neither do I like accidentally backing into a slimy bin of slaughtered birds. I’m not a sissy when it comes to getting up close and personal with what I’m going to eat. But that pile of raw chicken is just gross and wrong. Growing up in a very small midwestern town, my mother used to order our eggs and chickens from the egg and chicken man. The eggs usually had bits of stuff still stuck to them, and the chickens were very freshly killed, headless and disemboweled but with their feet and necks still attached, and had to be plucked or at least singed a bit. My fifth grade teacher was concerned that us town kids were not fully educated about where our food came from, so she took us on a field trip to her family’s farm where, among other things, we got to watch while her husband killed a couple of chickens. But piles of raw chicken left sitting around? No way. I’ve long gotten over my childhood squeamishness around raw meat, and I generally don’t mind getting up close and personal. The reasons I don’t frequent the meat section of our neighborhood market have to do with the utter lack of hygiene: I can literally scrape the mildew off the walls, and ancient blackened cobwebs hang above the food. This open meat bin at Tops is no better, except there it was in bright light so you could see precisely how gross it was.